Live In Place’s “Best in Class” evaluations - prior to your purchase - are conducted by Certified Occupational and Physical Therapists and aging-in-place specialists who are trained in home mobility and accessibility options. This ensures your peace of mind that the home modifications are right for the unique conditions and circumstances of your loved one, improving their safety while maintaining their independence. These assessments are a big reason why Live In Place is the number-one aging-in-place provider. Before modifying your home, there are critical considerations – not widely understood – prior to any purchase of equipment. Therapeutic analysis of what modifications are practical and necessary is key to making good decisions. Our recommendations are unique and medically sound, with a full discussion of the rationale behind them. Live In Place gathers information on the family circumstances during an initial phone call or in-person visit. At the home, we visit further and gather additional information, including an understanding of your goals. Then we begin the more specific assessment process. Walking – unobstructed and safe. Wheelchair only – portable ramps. Wheelchair and walking – modular ramps. Evaluate transition areas on all floor surfaces based on patient mobility. Railing replacement or adding a second set of railings to increase safety. Grips for transitions at top and/or bottom of stairs to increase safety. 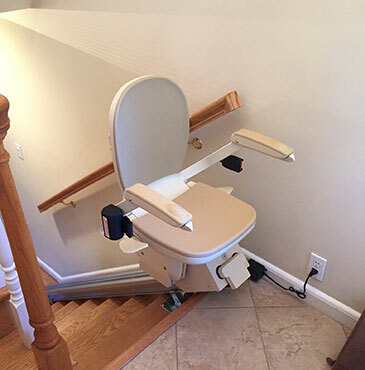 Stair lifts to provide accessibility to other areas of the home and to overcome challenges – such as joint issues, cardiac issues, neurological conditions, COPD – or just to conserve personal energy for other activities! Grab bars and grips to get into the bathroom. Toilet modifications for comfort and independence. Grab bars for toilet and shower areas. Transfer tub benches.When necessary or desired, bathroom remodeling is possible and effective. We help to prevent costly mistakes by providing designs with options, and an understanding of costs and timelines. Options to improve immediate safety. Consulting with an Occupational Therapist to improve independence and activities of daily living (ADLs). In a typical one-hour appointment, we work with you and conduct a safety and accessibility assessment. Our recommendations and multi-level options are based on client abilities, mobility level, medical and therapeutic diagnosis, and the layout of your home. Our recommendations and option levels are practical and understandable. We view iPad pictures together with you during the process, illustrating similar homes and changes that were made. We have served thousands of families since 2007, improving their safety and comfort! We counsel families on overcoming current and potential future challenges in the home, based on medical profiles. This allows a knowledgeable discussion by family members about both immediate and long-term options that will enable your loved one to remain at home. This is why Live In Place is #1 in the Northern Virginia / Washington D.C. area – because we provide medically based evaluations, recommendations, and modifications. Our years of experience show why we are the preferred experts. Our clients are able to go beyond their physical limitations to lead quality lives in safe and energy-efficient ways, in the comfort and familiar surroundings of their own home. A sudden medical event or tragedy is stunning and can leave your family overwhelmed with what decisions and changes may need to be made. We work with individuals and their families to quickly identify challenges and solution options for Aging-In-Place issues, progressive illnesses, or traumatic injuries. We discuss in practical terms why and which choices to consider and the direct benefit for safety, accessibility, and comfort.